As simple as this dish is, the outstanding flavors and gourmet-like quality of this recipe have the potential to fool you into thinking it's actually quite fancy. Mushrooms, onions, shallots, and garlic are sauteed in butter; white wine is added at the end of cooking, and boy does this do wonders for the mixture. It adds the most amazing richness, tanginess, and sweetness, and will make you want to add wine to everything you cook! Toss the mushrooms with cooked pasta, whipping cream, chopped parsley, and freshly grated Parmesan cheese...and you're done! It's best to serve this immediately so the sauce stays creamy and smooth...but beware, you might not be able to stop eating it! Seriously, it's that good. It's perfectly salted and peppered, rich with wine and butter, creamy, and cheesy...in fact, you won't believe this is a lowfat recipe! The wine really brings out the earthiness of the mushrooms, and the shallots and onions give it a nice pungent kick...oh yeah, and it's REALLY garlicky, yum! The fresh herbal notes of parsley finish the flavors off in just the right way. Just a few recipe suggestions: I couldn't find an "exotic mushroom blend," so I just used creminis (aka baby bellas) and they worked fine. Now...do NOT add the extra salt at the end. Trust me, you don't need it. 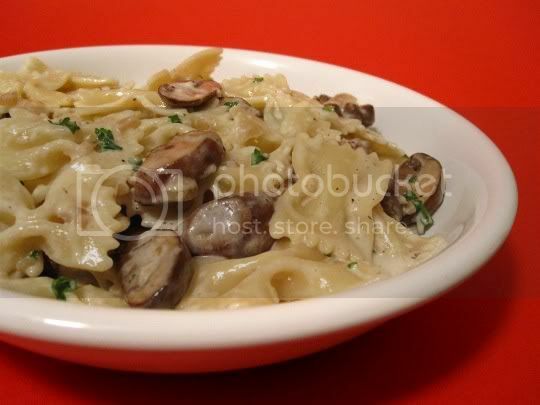 The salt in the mushroom mixture along with the Parmesan is already the perfect amount, and no more is needed. Finally, HALVE the amount of pasta. The sauce is TOOOOOO good to have all that pasta in the way. And if you're feeling even more adventurous, double the sauce/mushroom mxture! Make again? Definitely. A crowd pleaser (easily doubled, or halved), and a great idea for a date night!